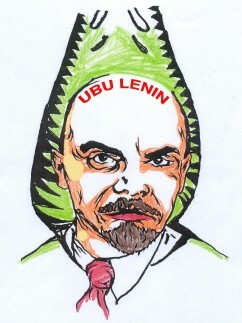 The fact that Lenin was a participating Dadaist in Zurich, though in disguise, served as a pretext for New York based artist Rainer Ganahl to rewrite the original Ubu play (by Alfred Jarry) as Ubu Lenin. Ganahl added some characters related to contemporary ubuesque investment schemes. Holy Ponzi!